Join the discussion on our forums! Come discuss Hyldnir Frostrider over in our dedicated Hyldnir Frostrider discussion topic. Can someone explain the mechanic when Hyldnir Frostrider have not frozen Squirrel (created by opponent's Tinkmaster Overspark) that have not attacked on purpose (I saw it on Shtan_Udachi's stream)? I guess it's because it is not "my" minion, because I have not played it, and it becomes "my" when I do attack with it, right? But what about mind-controlled minion by Mind Control or Mind Control Tech, etc.? Well, today I learned that's a polar bear not some sort of alligator. it's not even good without the text. Maybe you can trade first play this then morabi but that's just going overboard on the freeze shaman thing. Why would you first play this and then morabi? The other way around is so much better. 4/4 for 3 mana is very bland by today's standards. 3 mana 3/5's are just bearly good enough. 3) Player A plays e.g. The Lich King and pings the gastropod. If you watch the stream you will see when they playd the card and the frozen minion unfroze right when the turn ended. mening that the frezing mechanic has changed and now unfrezes the minions that are frozen at the end of the turn of the player that have the frozen minion. so this card is good if you just play it after you are done attacking. 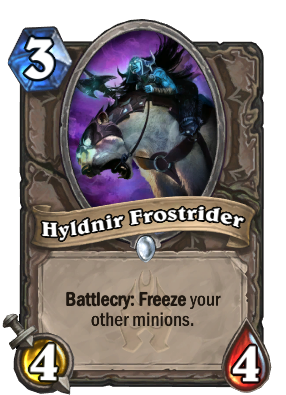 Edit: I just reilized somthing that Cryostasis gives +3/+3 and only frezes the minion untill (if you buffed your minion) the end of you turn and Frozen Crusher from ungoro is now a 6 mana 8/8 that only frezes him self untill the end of the turn. it froze the Shaman taunt totem that hadn't attacked that turn already and thus lost it's "next attack"
First card featuring female vrykul? She's riding the rare mount you get from one of her faction members. Will your frozen minions be able to attack during your next turn? If so, what's the downside haha. The frozen minions will no be unfrozen the next turn.